GOP Demonizes Once Favored Cap-And-Trade Policy Republicans say the Environmental Protection Agency will kill jobs and raise electricity prices with new carbon emissions limits. They're up in arms about a measure their party previously championed. 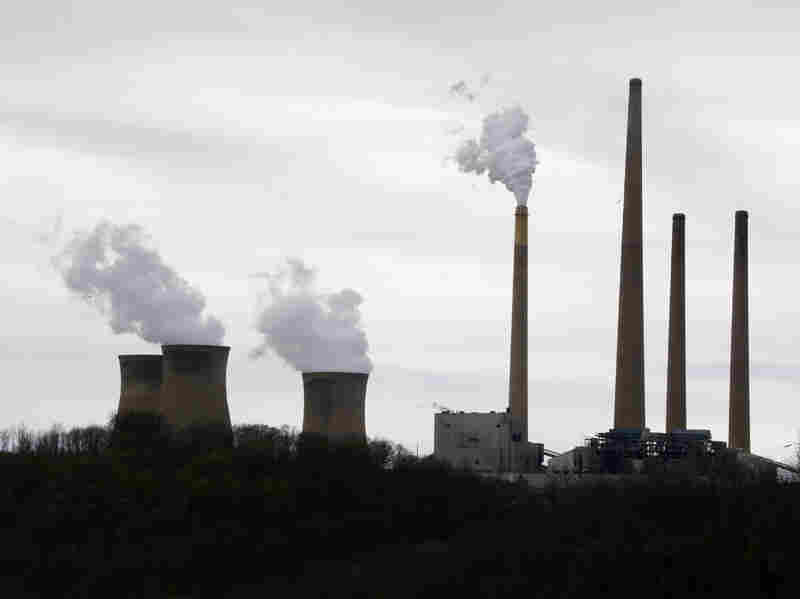 The Homer City Generating Station in Homer City, Pa. Republicans say the Environmental Protection Agency will kill jobs and raise electricity prices with new carbon emissions limits. Republicans say the Environmental Protection Agency will kill jobs and raise electricity prices with new carbon emissions limits. But their tactics in fighting the proposed rules are targeting a policy that their own party championed during GOP presidencies. Republicans are touting a letter signed by 41 GOP senators asking President Obama to withdraw what they call his "cap-and-trade rule." Cap and trade is one of the policy tools that would be allowed under the EPA proposal for states to achieve the new emissions standards. In recent years, the term "cap and trade" has become a dirty word for many Republicans. But Republicans used to be the big advocates of cap and trade. It was originally a conservative idea because it's a market-based approach to environmental regulation. Robert Stavins is a Harvard economist who was on the EPA's Environmental Economics Advisory Board under both Republican and Democratic presidents. And he watched Presidents Reagan, George H.W. Bush and George W. Bush push through cap-and-trade approaches to pollution controls. Stavins is concerned about Republicans now tarnishing what he sees as a useful policy tool. "Well, it is very ironic," he says. To explain how cap and trade works, Stavins took us outside to a parking meter in Harvard Square near his Cambridge, Mass., office. He says limiting carbon emissions is kind of like a city limiting the amount of time people are allowed to park somewhere. The city could limit parking to one hour. That would be the "old-style" conventional regulatory approach, he says. 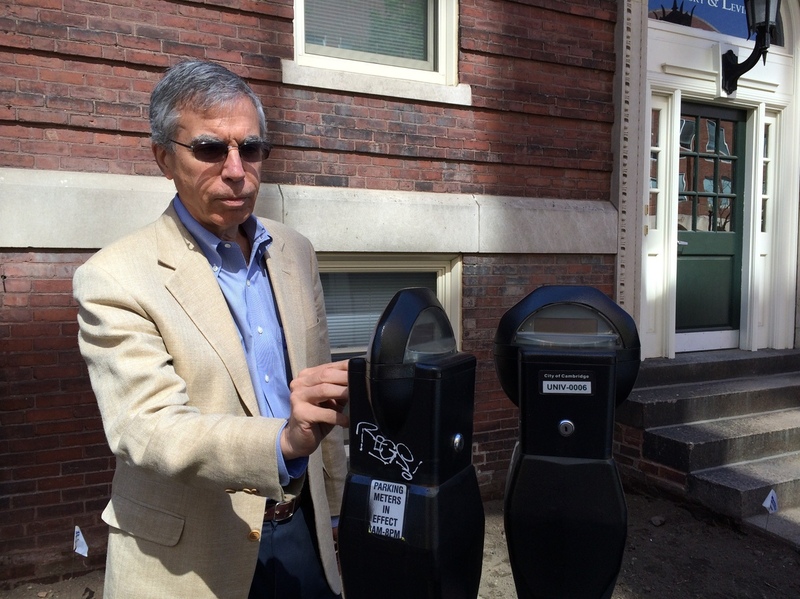 Harvard economist Robert Stavins compares cap and trade to buying tokens to feed a parking meter. But that's very inflexible. Somebody needs to park for 10 minutes to grab a sandwich, while somebody else has to park for two hours for a doctor's appointment. The parallel with power plants is that it's often much easier for one plant to cut emissions and much harder for another one to do so. So under cap and trade, the government issues the industry tokens, if you will, to plug into the EPA's pollution meter. If you really need to pollute, you can put in tokens, at least until you run out of them. What do you do when you run out? "What you do is buy tokens from others that have them," Stavins explains. And he says in a real "pollution market," as he says we've had in the U.S. and other parts of the world for other types of emissions, "there are platforms on which you could go to buy those rights." There's a limited number of tokens created by the government: that's the cap. But private companies get to decide where it makes the most sense to cut emissions and where it makes more sense to keep burning coal. Stavins says in the Reagan years, Republicans and conservatives loved this idea and it was Democrats who were skeptical. "Democrats of that era were much more suspicious of the market," Stavins says. "I remember they characterized cap-and-trade systems as 'licenses to pollute.' "
But Reagan pushed through a cap-and-trade system to phase out leaded gasoline. And in 1989, President George H.W. Bush proposed a cap-and-trade system to cut, by half, sulfur dioxide emissions (acid rain) from coal-burning power plants. And both Democrats and Republicans got behind it. In what today might seem like an almost unbelievable show of bipartisanship, those Clean Air Act amendments passed the House and Senate overwhelmingly. The big change came four years ago, when Democrats wanted to push through a climate change bill. Republicans opposed it. And Stavins says in the political fight, Republicans bashed cap and trade just because it happened to be part of the bill. For example, in a 2010 campaign ad, Sen. Marco Rubio said: "If cap and trade were imposed on America it would devastate economic growth, it would get rid of jobs, it would be permanently debilitating." Republicans called the bill and its approach "cap and tax" and said it was a move by tax-and-spend Democrats to grab revenue and make average people pay with higher electric bills. Stavins says the root of that criticism came from a line in one of the Obama administration's proposed budgets where the administration said it would get revenue by selling those tokens that the power companies would need in order to pollute. Stavins says the actual legislation didn't call for that and could have disallowed it. But "cap and tax" stuck and became an effective slogan to help defeat the bill, he says. Some prominent Republicans, including Sen. John McCain, used to support cap and trade. But since that legislative battle four years ago, they've said they're against it. Stavins says those 41 Republican senators who signed the latest letter are once again bashing cap and trade. And he's worried about that. "I think unfortunately what's happened is that conservatives have sort of boxed themselves into a corner because they've demonized the very instrument that they had created and the very instrument which is cost-effective and therefore is the friend of low-cost but effective environmental regulation," Stavins says.